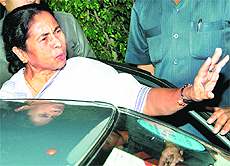 Even as its most troublesome ally Trinamool Congress chief Mamata Banerjee insisted that APJ Abdul Kalam was her first choice in the presidential race, a combative Congress hit out at her. When Army Chief Gen Bikram Singh lands in Jammu and Kashmir tomorrow, he will bring with him a new message of ending clash of egos that had erupted between his predecessor Gen VK Singh and the state government over the revocation of the Armed Forces Special Powers Act (AFSPA). Accepting Commission for Agriculture Costs and Prices� suggestions for 2012-13 kharif season, the government today announced a Rs-170 hike in the support price of paddy to boost production and procurement and also counter fears of erratic monsoon in key rice producing states Karnataka, Andhra Pradesh and Chhattisgarh where elections are due this Crop Year. The Obama administration�s decision to exempt India from sanctions for its oil imports from Iran. Who can forget the famous bear hug Fidel Castro gave to Indira Gandhi when the Cuban leader passed on the chairmanship of the Non-Aligned Movement (NAM) to the Indian Prime Minister in New Delhi in 1983. But with the end of the Cold War, India drifted away from Cuba with small bilateral trade and even smaller political exchanges between the two countries. While a soldier who had been critically injured in Pak firing on Indian forward posts along the Line of Control (LoC) in KG sector of Poonch district yesterday, was brought dead last night, calibrated response of the Indian Army injured two Pak soldiers. Reports from agencies say there has been no let-up in the firing. The slain soldier has been identified as Lance Naik Harvinder Singh. One in three elderly in India is facing abuse and a majority of them is residing with their families. The third annual HelpAge Survey on Elder Abuse in India released today revealed details of how an ageing India is silently suffering abuse to preserve family honour.